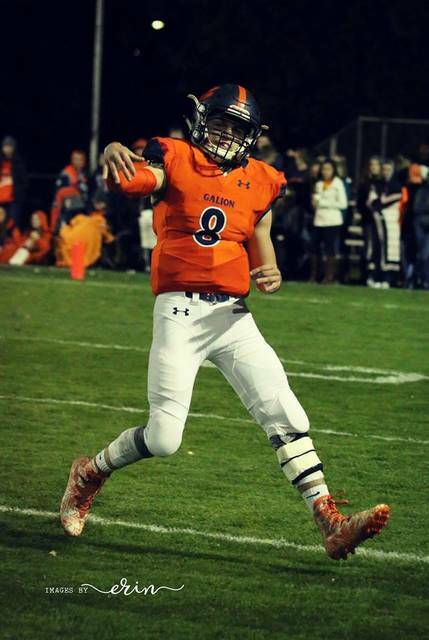 Erin Miller | Galion Inquirer Galion quarterback Harrison Ivy, wearing No. 8 in honor of his father, Kendall Ivy, attempts a pass during Friday night’s season finale at Unckrich Stadium. The Tigers dropped the contest to the Buckeye Valley Barons; 44-14. GALION — In less than desirable conditions, the Galion Tigers football squad welcomed the Buckeye Valley Barons to Unckrich Stadium in Heise Park for a week 10 Mid-Ohio Athletic Conference gridiron clash. Galion would be handed defeat by the Barons; 44-14. With the loss, the Tigers season concludes at 5-5 overall and 2-5 within the MOAC, putting them in a three-way tie for fifth with North Union and River Valley. Buckeye Valley improves to 7-3 on the year and finishes MOAC play in third with a 5-2 record. Buckeye Valley’s Trent Davies, the top rusher in the MOAC, opened up the game with a 16-yard touchdown run on their first possession after Galion went three-and-out on the opening possession of the game. With the added extra-point, the Barons were up 7-0 over the home team. Davies would prove to be far from finished, scoring the second Barons’ TD in the opening frame, this time from 58-yards out. Another PAT put the score at 14-0 in favor of the Barons. Davies would add a third touchdown in the first 12 minutes of the game on a 15-yard TD run, add the PAT and Buckeye Valley closed the first up 21-0. Galion would put themselves on the scoreboard in the second via a 52-yard aerial strike from quarterback Harrison Ivy to receiver Takoda Crisman. Dominic Pittman tacked on the extra-point to make the score 21-7 in favor of the visitors. The Tigers defense could not contain Davies and the Barons “O” as Davies added his fourth TD on a four-yard run in the second and the extra-point put the Barons up; 28-7. It would be the Buckeye Valley defense scoring the final points for both teams in the first half. Joey Verdes picked-off Ivy’s pass attempt for his fifth interception of the year and would rumble his way to the endzone for the coveted “pick six”. Another extra-point by the Barons would send them into halftime up by a score of 35-7. First half offensive totals: Buckeye Valley- 205 total yards, 4 TD on 5 possessions, 1 punt; Galion- 109 total yards, 1 TD on 6 possessions, 4 punts, 1 INT. As the cold rain continued to pound down, the Buckeye Valley squad would open the second half with the football. On their first possession, the Barons would commit their first of three turnovers on the night, all fumbles. Galion, however, would be able to turn it to any points and would eventually punt the ball away after 45 yards of offense. The Tigers would eventually score the only points by either team in the third quarter on their second possession via another lost fumble by the Barons’ “O”. Ivy would once again connect with Crisman for a touchdown pass, this time from 25 yards out. Pittman added his second and final PAT of the night to put the score at 35-14. After a few punts, the Barons defense would earn a safety after a botched lateral by the Tigers offense within their own five-yard line. Buckeye Valley, now up 37-14, would add their final touchdown via the fifth rushing TD of the game from Davies. The PAT would put the Barons up 44-14, trigger the continuous clock and, after another Ivy interception, end the ballgame. Game offensive totals: Buckeye Valley- 374 total yards (308 rushing, 66 passing), 5 TD on 10 possessions, 2 punts, 3 lost fumbles; Galion- 185 total yards (109 passing, 76 rushing), 2 TD on 11 possessions, 6 punts, 2 INT, safety. Note: Trent Davies carried the ball 45 times en route to 295 rushing yards and 5 TD. Davies also caught 3 passes for 59 yards to equal 354 total yards from scrimmage. Offensive statistics for Galion were: Team- 22 carries, 76 yards, 11 catches, 109 yards, 2 TD; Ivy- 9/26 passing for 127 yards, 2 TD, 2 INT, 13 carries, 91 yards, 1 catch, 4 yards; Isaiah Alsip- 1/1 passing for -22 yards, 3 catches, 31 yards; Elias Middleton- 1/1 passing for 4 yards, 1 carry, -4 yards; Crisman- 2 carries, -5 yards, 5 catches, 55 yards, 2 TD; Nakoma Breedlove- 4 carries, 4 yards; Gavin Pennington- 1 catch, 13 yards and Trevor O’Brien- 1 catch, 6 yards. Other MOAC results Friday were: Clear Fork (10-0, 7-0) 41, Harding (6-4, 4-3) 14; Clear Fork wins the MOAC title in its first season in the conference; Pleasant (8-1, 6-1) 41, Ontario (2-8, 0-7) 14; Ontario goes winless in conference play in its first season in the MOAC; River Valley (4-6, 2-5) 19, North Union (4-6, 2-5) 18.
https://www.galioninquirer.com/wp-content/uploads/sites/38/2017/10/web1_Harrison-as-No.-8.jpgErin Miller | Galion Inquirer Galion quarterback Harrison Ivy, wearing No. 8 in honor of his father, Kendall Ivy, attempts a pass during Friday night’s season finale at Unckrich Stadium. The Tigers dropped the contest to the Buckeye Valley Barons; 44-14.